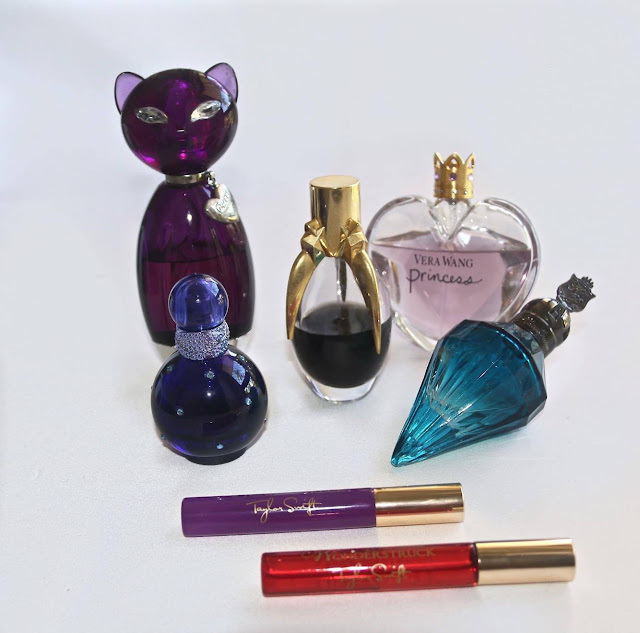 My perfume collection mainly consists of celebrity perfumes! I love perfume, scent is something that reminds me of good times! Whenever I go on a cool holiday or i'm doing something really exciting I like to wear a different perfume! So that whenever I smell that specific perfume against it will remind me of that time! Here are the perfumes I own! Firstly I love every Katy Perry perfume I have ever smelt! I currently have 2, though I am considering buying a few more!! Purr the one in the giant purple cat bottle has a lovely, sweet, floral, vanilla scent!! This reminds me of winter in Victoria because I use to wear this every winter! The second Katy Perry perfume is Royal Revolution, this is the one in the light blue bottle! This has a very fresh, woody, floral scent to it! I really like fresh floral scents! If you're not into that these perfumes probably aren't for you! Royal Revolution reminds me of Christmas in 2014! We went to Philip Island and I wore this the whole time! Fame by Lady Gaga! This is definitely more of a night time scent! I don't have one specific memory tide to this perfume though it does remind me of many nights out for dinner and good times! This has a very honey scent to it! Also fruity and sweet! It's a lovely perfume! The Britney Spears perfume is in the dark purple/blue bottle! Its a lovely deep fruity scent! I don't usually wear this during the day as I like something a bit more sweet and floral during the day but its a perfect night time perfume!! I have Taylor Swift Wonderstruck in the purple roller ball and Wonderstruck Enchanted in the red roller ball! These are both very fruity and fresh! Both have a vanilla scent to them! These are great for traveling and taking in your handbag as they are pretty small and are roller balls so less easy to spill! Lastly I have my beloved Vera Wang perfume in Princess! This is in the back right! Pretty easy to see as it says Vera Wang Princess on the front! Its a lovely fresh floral, fruity scent! This is my everyday perfume! I received this for Christmas in 2015 and have been wearing it ever since!! I don't usually repurchase perfumes but when this one runs out I am really considering repurchasing it!! What's on your perfume wish list?